In order to use the FlexGrid, you need to add the necessary references to our application. These include the AngularJS, Wijmo5, and Wijmo5’s AngularJS directives. In this instance, Wijmo5 does not have any third party dependencies other than AngularJS. Add a controller to provide some data and logic. Note: for this demo you're using http and interval, so don’t forget to pass those. Now that you have all the necessary references and configured your AngularJS application, you’ll add FlexGrid markup in between your body. For the purpose of this sample, you’ll connect to the Northwind data service. If you look at my plnkr or sample code, you'll see the logic you need to connect to that service. For those of us who have used Northwind before, the bindings should seem familiar. For those who haven’t, I encourage you to review the diagram above since you're dealing with joined hierarchical data. Here, you'll create a new FlexGrid and create two columns. Bind each column to the name of the category and the description. 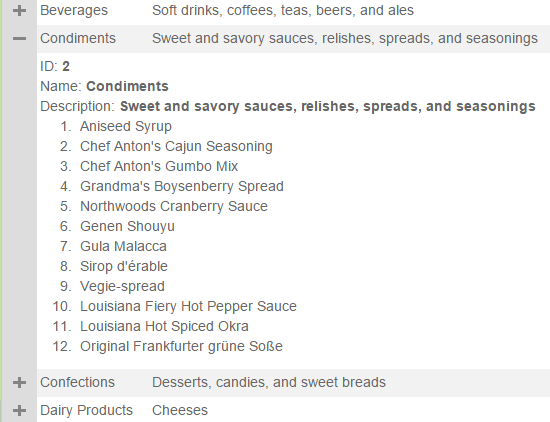 For this example, you'll start off with the markup from the index.html file from the attached sample. In the next section you’ll add a FlexGrid to the DetailRow. If you’d like, you can embed another instance of FlexGrid into the DetailRow. In this case, you’ll want to bind the second instance to a different dataset. This will require some configurations in your app.js file. 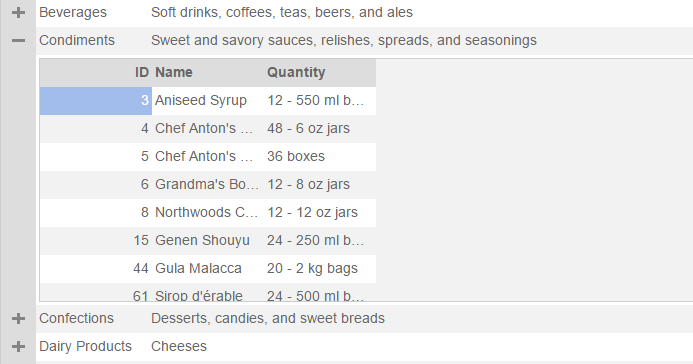 To begin, you need to be able to select the details of the unique row that the user is requesting. Use a getProducts() function to get all of the products for that category, and return them to a CollectionView for the new FlexGrid to consume. Next, you’ll need to add some code to your function. The first section adds the grid’s max row height; then you’ll define your createDetailCell() function. Finally, you’ll define your function which marks the rows that will have details. Finally, define which rows will have details. The following code goes inside, and in this case, it marks all rows. You can change the modular value to do even or odd. Maybe you'll want to use the FlexGrid to visualize data from the DetailRow. 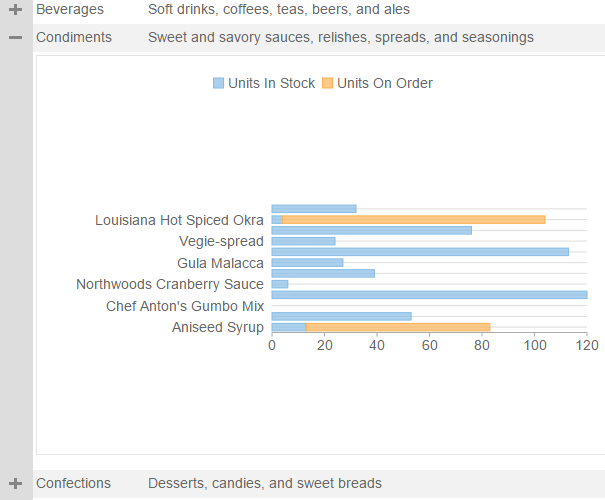 For example, you want to see your stock numbers for a particular product and compare that to what you have on order. 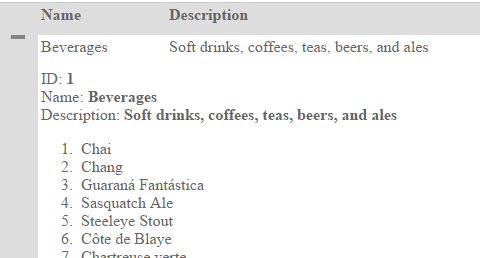 In this situation, you want to use a bar or column chart. You don’t need to do anything to your app.js file because you already have a products CollectionView. Add a FlexChart inside your DetailRow directive. 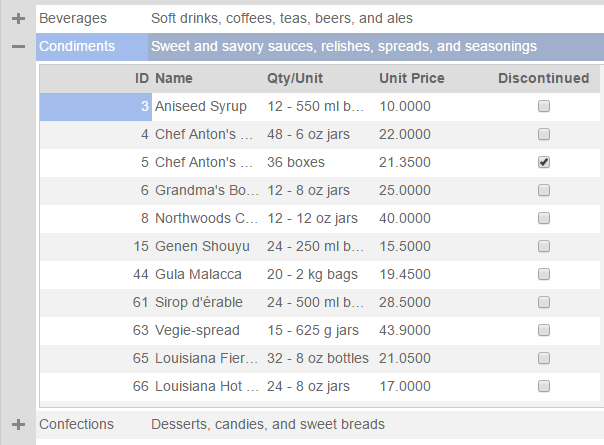 Bind the FlexChart items source to the same getProducts() function, pass it the type of Column. Finally, bind your x axis value to the ProductName. Once you’ve added the FlexChart, add two series to the chart. Stay tuned for part 2, when we'll cover more advanced features.